Last week I had the opportunity to see my brother for the first time since Christmas. We don't get to see each other often because of his crazy work schedule, so I wanted to make the most out of this trip. After settling on hiking we couldn't make up our mind on which hike to try. After much debate we agreed upon Angel's Rest. The hike certainly wasn't easy for a novice hiker like myself. On average the trail grade was 10-15% which resulted in an elevation gain of 1450 feet. I stand at a measly 5' 4" while my brother is over 6'. He was practically racing up the trail most of the way while I was scrambling behind. Our hike started off with an immediate climb and a great view after only five minutes. About .6 miles into the hike we reached the top of Coopey Falls. You could see the falls earlier on in the hike, but I wasn't willing to get close enough to the edge for a photo. Please excuse the terrible photo, but I wanted to capture all of the wild iris' we saw throughout the hike. I hate taking lower quality photos with our point and shoot, but I don't have a backpack that is padded enough to take my DSLR hiking. This was our view about half way up. It certainly was enough encouragement to keep going. At this point we could have continued on to Devil's Rest which eventually loops around and takes you to Multnomah Falls. Considering that this was our first time hiking this trail we decided it would be best to save that for another day. We finally made it to the top after an hour and a half of hiking. The view was spectacular despite my slight fear of heights. I chose not to venture much closer to the edge because the wind was strong enough to knock a small kid over. This was probably my favorite hike so far because the view from the top made the difficult hike entirely worth it. If I were to hike this again, I would do it on a cooler day and after I had broken in my hiking shoes more. 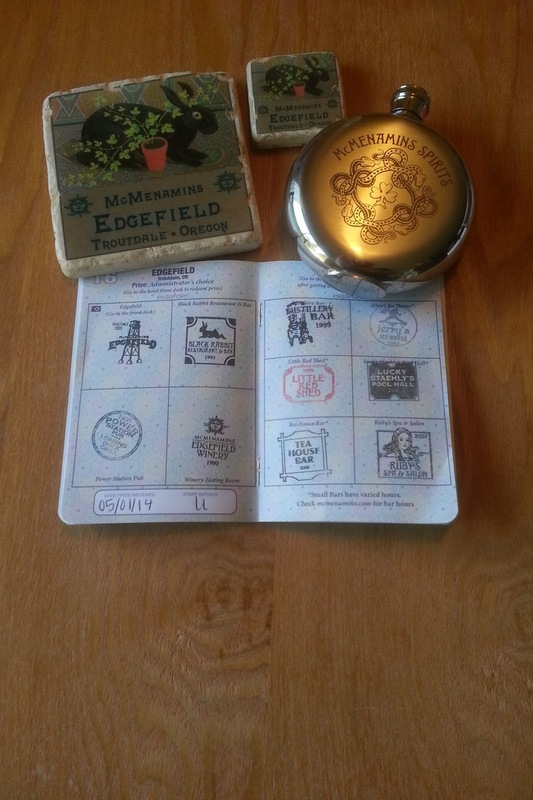 We ended our day at McMenamins Edgefield so that we could refuel and get our passports stamped. The passport program is a $20 purchase that rewards you for visiting different McMenamins locations. Brian and I both have passports, so when we completed our Edgefield pages we each got to choose a prize. If you are local I recommend checking it out! What a gorgeous view during the hike! What a perfect reward! That flask is so cool! I love beautiful scenery like this. Its so relaxing!